This chart is showing how at current bond rates have traded below the cost increases to the Consumer Price Index (inflation) and combined with taxes, investors in bonds may be losing money before rates even begin to rise. 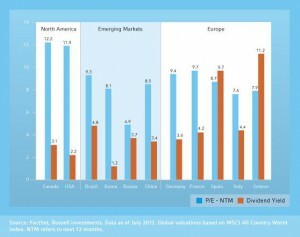 Fidelity Investments on Canada versus International Stock MarketsLink to Chart Canada represents only 4% of the global stock market and our home country bias may limit our opportunities to a very small selection. The convenience of being dropped off at the door is appealing, although I’m not sure how badly I need this convenience. More importantly is the potential and the implications of new technologies. 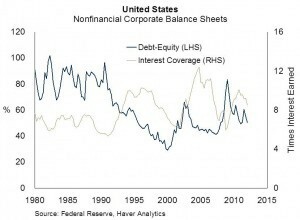 Solid interest coverage and balance sheets continuing to improve.